This set is no longer supported after toddler update, it has therefore been removed from mediafire and Onedrive. These sofas were going to be a part of my followers gift, but I held them back due to a shadow glitch caused by the cloning process. It was a shame, but I hate releasing stuff with bugs and it was a major one. 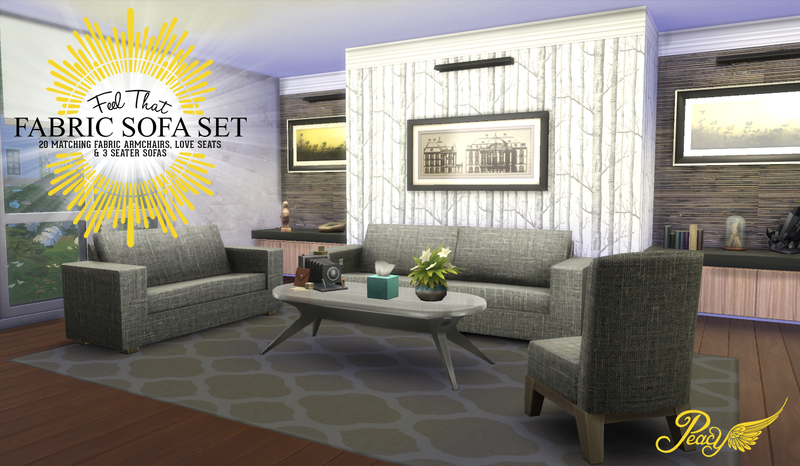 With the latest update of S4S, it fixed that bug and I can share these gorgeous sofas with you. I loved the base sofas, but I really love fabric and knew it improve the overall atheistic. So I went about making them, all 20 styles. I did come across one imperfection I have no control over. The love seat and armchair UV maps are halved to save space. That means the pattern is mirrored either side of a cental line. I don't find it that obvious and is not something I can change, however you need to know. The archive contains the package files for the 3 seater, loveseat, and armchair as well as the cover image. Just place in your mods folder and look for them in your game. I hope you enjoy. Thank you very much for the matches, love the fabric choices too. Excellent! You have such a beautiful game and style, I love everything. Thank you! thank you! i really want this styles stuffs! it was awesome, love that! honestly, thank you so much! You have amazing style! Thank you for the beautiful downloads.